If you planted basil this spring, you probably have an abundance of basil ready for harvest. Congratulations! Now what are you going to do to enjoy all that lush flavor? 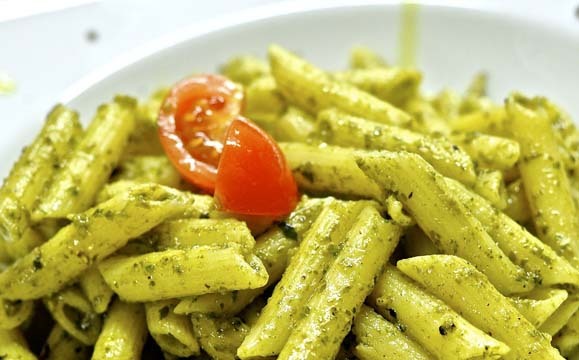 Eat it fresh in pesto…certainly, but there are limits to how much pesto a person can eat. How can you “have your cake and eat it too”? Time to try something new and freeze that flavor. Start by harvesting an armload of basil stems. Pause to inhale deeply the enjoy to wonderful spicy aroma. Clip the leaves from the stems, rinse, and spread them out on an absorbent towel to air dry for 30 minutes. Now you have a decision to make – do you want to free the leaves whole or finely minced? Clip freshly harvested leaves from the basil stems. This makes them ready to freeze or dry, your choice. Remember to select just the green and healthy leaves. Badly damaged leaves won’t have much flavor. When you freeze basil leaves whole you will maximize the amount of preserved essential oils, what give basil or any herb its flavor. Loosely layer the leaves on a tray and place them in a freezer for about 15 minutes. Because basil leaves are thin they will quickly freeze to the point of being crackly. Remove the tray, quickly gather the leaves into an airtight container, and return them immediately to the freezer. Frozen basil leaves will defrost quicker than you might think. 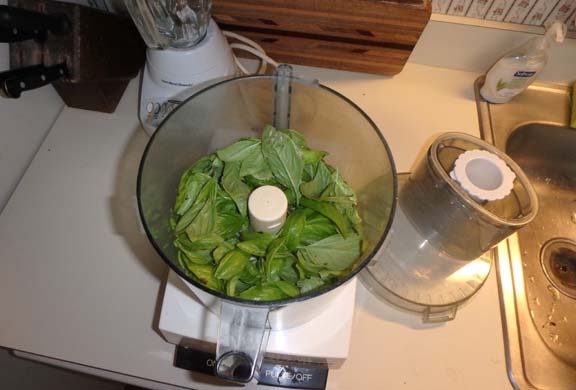 To make a basil slurry of minced leaves place fresh basil leaves in a food processor and pulse until coarsely chopped. If you want to preserve flavor but aren’t as concerned about looks, freeze basil in a minced form. 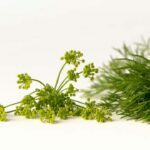 Place freshly harvested leaves in a blender or food processor. Process for a few seconds to coarsely chop the leaves. Then add enough water to form a slush and process again until finely minced. Do not over-process or you will get something that looks like you were trying to make a smoothie and failed. Here’s the finished product of the basil slurry, poured into an ice cube tray and ready to go to the freezer. Pour your minced basil slush into ice cube trays and freeze for about five hours. Remove from the freezer and run the tray under warm water for about a minute to loosen them. 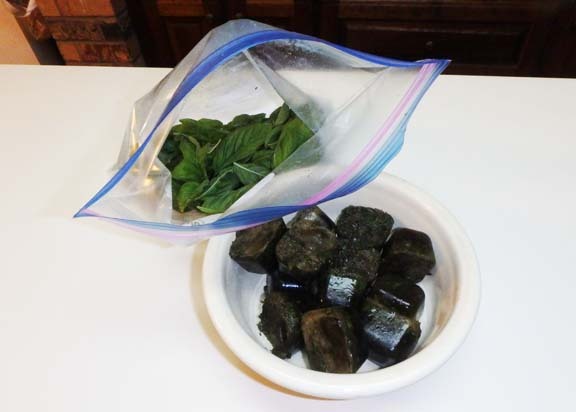 It takes longer for basil cubes to release from plastic trays than ice cubes. 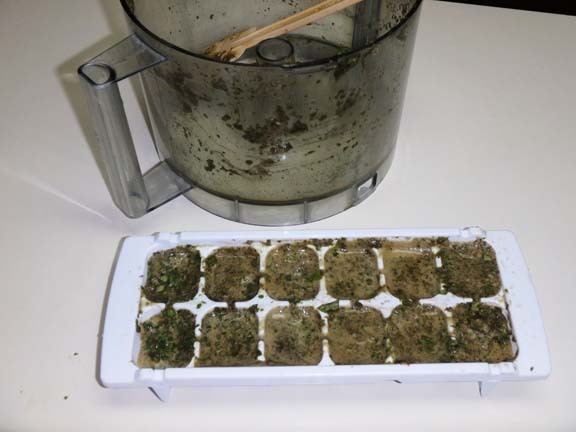 Pop the basil cubes out of the tray and store in a freezer container for later use. The final result of freezing some leaves whole and others in a frozen cube of slurry. To clean the ice cube trays, soak them in water with a little bleach. 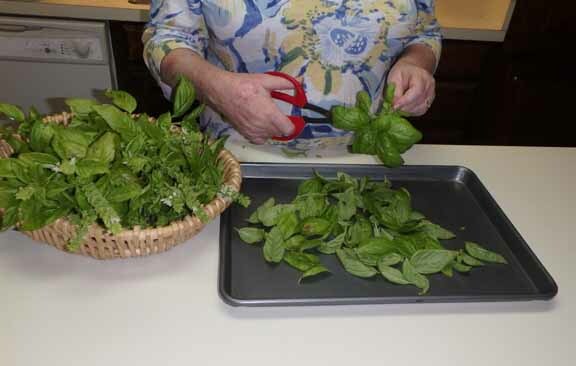 Chopped basil will cling to plastic trays, making them unsightly for ice cubes. Run the bleached trays through the dishwasher before reusing. To use frozen leaves, remove just enough from the freezer just before you are going to use them. The leaves will wilt from the freezing process but will still have the basil flavor. Mince or tear the leaves and use in you foods. To use frozen basil cubes, remove as many as you intend to use. Each cube is 2-3 tablespoons in volume. You can add them directly to a bubbling soup post or defrost the cubes in a small bowl before adding to foods.